Set in Vancouver’s Chinatown in the 1930s and 1940s, Choy continues the story of the Chen family, first introduced to readers in The Jade Peony, this time narrated by First Son, Kiam-Kim. We meet Kiam-Kim at the age of eight, staring at the yellowed photograph of his mother, who died in China when he was just a baby. 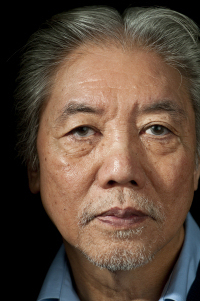 Kiam-Kim, Poh-Poh (his larger-than-life grandmother) and Mr. Chen, his demure and honest father, journey to a new life in Vancouver’s Old Chinatown. Following the dream of finding gold and then one day returning to China – wealthy – they, like many of the Chinese families around them, find themselves caught in a country on the brink of the Second World War, struggling to survive in a foreign land and keep alive the traditions of an older world. 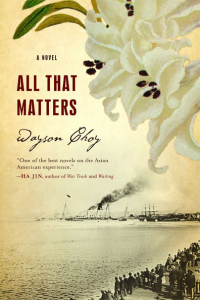 Finely-crafted and rich in historical detail, All That Matters depicts 1930s Vancouver in the haunting hues of memory, and sees in the Chen family a fragile miniature of a larger world. Dwelling on Kiam-Kim’s sense of responsibility to his community, Choy unfolds the Chen family’s secrets in thoughtful and luminous prose, leading the reader to a breathtaking conclusion that far transcends the limits of its time and place, and gestures towards all humanity.